The Chelsea-adidas partnership is coming to an end with a new 15-year deal with Nike set to start in ahead of the 2017/18 Premier League season, meaning that 2016/17 is the last season where the Blues will wear the iconic 3-Stripes. Soccer365 looks back and select our Top 10 best looks from the era. A shocking and dynamic design was featured on this jersey, making it difficult to stop looking at it. Yes, it looks kinda like a music equalizer, but still looks great thanks to the superb combination of blue hues. A proper and accurate design, featuring an elegant collar and refined pinstripes on the front to create a good-looking, lovely home kit. This was the first season with the Yokohama Tyres sponsorship, which took a while to settle in our minds following a long partenrship with Samsung. Black and white is always a win. Back in 2013, this rule was well applied for Chelsea’s 3rd shirt. A really smart and stylish kit made with a soft and light fabric. adidas brought red back to Chelsea’s home jersey that year, something that few saw coming and was ultimately well received among fans despite being an iconic color from their bitter rivals Arsenal, Manchester United and Liverpool. To make things better, this shirt had a very technological fabric on its front and back, specially knitted for this kit to enhance the player’s performance. There’s no way you think this isn’t a beautiful kit, the sky blue sash looks great on white base, but the jersey’s greatest feature is the gradient effect on the 3-Stripes, something that adidas have done with very few shirts in their long history, which makes this design somewhat unique. This is the proof that ‘safe and simple’ isn’t always a bad thing. The German brand delivered a very classic Chelsea home kit; that retro-style V-cut neck hit the target, combining perfectly with the pinstripes on the fabric. This was a great season for Chelsea’s kits. 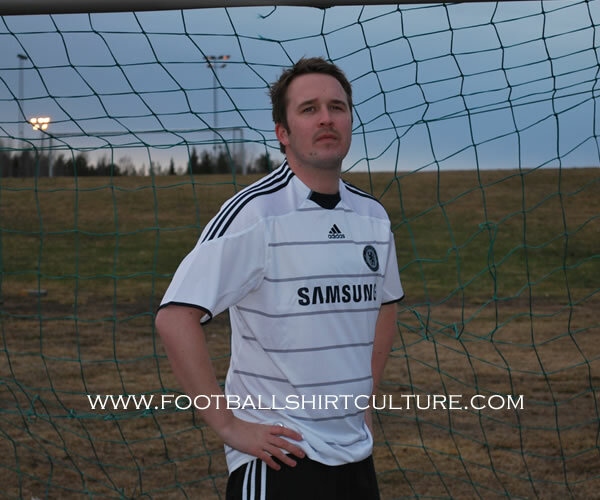 This away jersey is a very clever design that mixed a modern look with a classy style. The striking neon yellow detailing helped the uniform become bright and eye-catching. 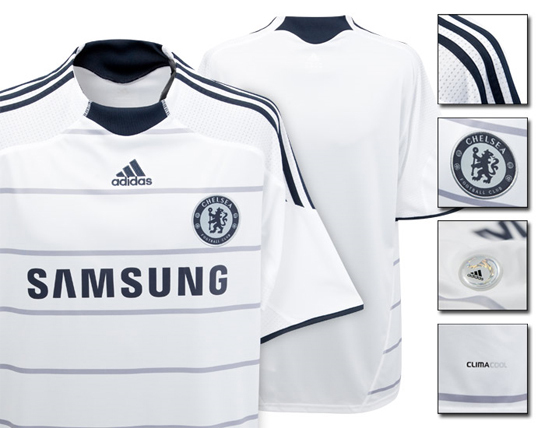 In 2009 adidas came up with this fresh-looking and modern kit for Chelsea, changing the fabric to make it lighter and comfortable. The small detail on the front collar and the chest armor-like panels were great and marked a tendency. This is a very refined design, with a perfect color mix for a Chelsea away kit. This one holds a special place for the Blue fans, who won’t ever forget the day they knocked-out Pep Guardiola´s Barcelona at the Camp Nou in the 2011/12 UEFA Champions League semifinals. This is one of the smartest jerseys in football history. That season Chelsea’s classic blue was mixed with fine gold details. This was because London was hosting the Summer Olympics that year, so Chelsea brought gold and shine from Olympic medals to their shirt. The color was also perfect to celebrate their 2011/12 UEFA Champions League title. Which Chelsea adidas jerseys form your top 10? Sound off in the comments section below! 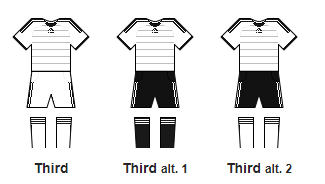 2009/10 Third Kit, 2nd Alternative (White L/S shirt, with the Black shorts and White socks, Silvered/Darkened Badge) TBH, all 3 combos look boss.